Looking back over my 3 years at uni, there are few tips & tricks which I learnt along the way which helped me through – some of which I still use now, even though I’ve now got a ‘proper job’! 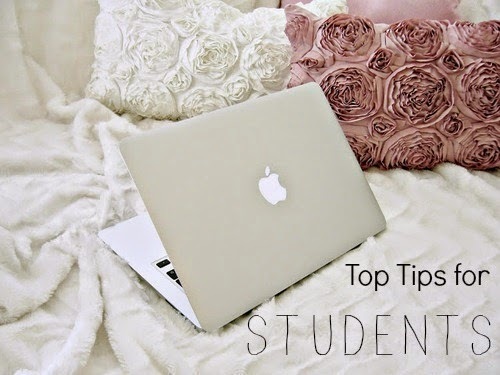 When Currys asked me to share some Top Tips for New Students, I thought it would be a great opportunity to share them with you! So whether you are thinking about which uni to apply for (I feel sorry for you – UCAS is the enemy) or if you are about to embark on your final year, I hope you find these #CurrysStudentHacks useful! 1.) Get free things! If you are studying in a large city, there is so much you can do, and get for free. For example in London you should keep an eye on magazines like Time Out and Stylist for free events – just last week I got to see Love, Rosie at the Charlotte Street Hotel for free, with a glass of wine and popcorn, courtesy of Grazia Film Club. Also, in-store events = free champagne, join up to mailing lists to find out what events are going on near you. For beauty products, I confess that I am the queen of picking up free samples. If you see an advert for a newly launched beauty product, chances are that the beauty counters will be giving out free samples. I think in my first year of uni I never purchased foundation, moisturiser or perfume because I lived off the freebies! Always keep an eye out for when companies are sending out samples via their website too. I find this Facebook group is good at pointing out these, and I’ll always share my favourites on Twitter too. Right now, get a free sample of Smashbox Primer here. 2.) Shopping – choose your moment. The big high-street retailers always offer additional student discounts at certain times of the year. More than just your usual 10%, it’s worth waiting until they offer 20% or even 25% off for students. Sign up to MyUniDays to get an email when they do this – and hold off any big purchases til then! Also keep your ear to the ground for sample sales – you can pick up some major bargains here and can sometimes even make a little profit if you sell them on. My favourites are the Monica Vinader Sample Sale, and the Kate Spade Sample Sale – I’ll post the ones that I hear about here and also on my Twitter! Be sure to make friends with the shop assistants too – they know when the next sample sale is and also when the Sale starts – this is seriously useful knowledge! They also sometimes have the power to knock an additional 10% off your purchase price, especially in slightly more upmarket shops like Reiss and Whistles. 3.) Invest in the right tech. I spent a lot of time in my first year struggling to finish assignments (or even get on the internet) because my laptop was from the stone age. Make the most of the discounts available to you (you can get up to 20% off at Currys PC World) and invest in a great piece of tech as soon as you can afford it. This will save you time and money in the long run. If you fancy winning a bit of tech yourself, then just share your Top Student Tips today and share using #CurrysStudentHacks – you can get your hands on a stylish laptop from their new collection – find out more about how to enter here. So there are my top 3 tips! I hope you find them useful, and don’t forget to let me know what your top tips are too!